Review this theme and receive 10% off your next theme purchase from us (PM us before purchase to get your discounted offer). Salix is a simple, responsive concrete5 theme built using Bootstrap v3.3. The theme provides multiple layouts and plenty of colour customisation options. The theme comes with step by step instructions, and includes many features such as support for animation, an accordion block and custom templates for creating blogs and portfolios. If you would like a custom concrete5 theme, or customisation of this theme, please send us an email. Responsive design. Your website will look good on a mobile, tablet or computer. Responsive bootstrap menu. The menu is a two-level Bootstrap menu that stays fixed to the top of the page as the user scrolls down. Sticky footer. On pages with less content, the footer stays at the bottom of the page. Custom templates. Custom templates for portfolios and blogs. 7 colour presets. Easily change your theme colours with one of our 7 presets: aqua, blue, green, orange, pink, purple and red. Lots of colour customisation options available from the concrete5 dashboard. Sample content - choose to install the theme with sample content, or without. User guide - step by step instructions included as a PDF in the Salix package's folder. PLEASE NOTE: This theme is built for concrete5 v 5.7.x. If you currently have a website using Salix for concrete5 v 5.6.x, you will not be able to upgrade directly to this theme. 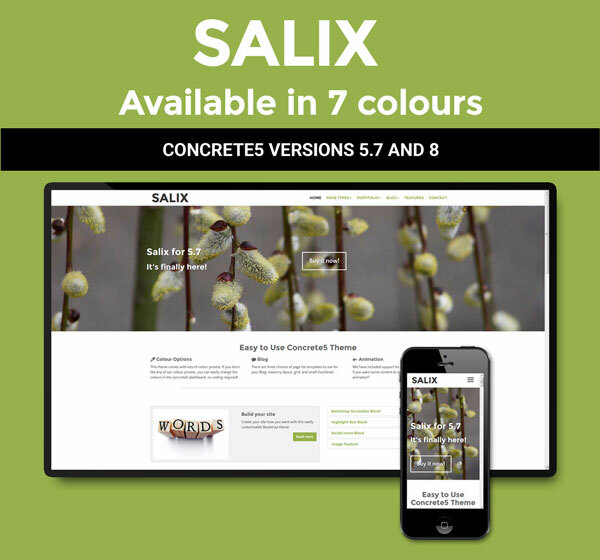 20% off - If you have previously purchased Salix for concrete5 v 5.6.x, you can purchase Salix v 5.7.x and receive 20% off the usual price.